New route has been announced and it looks a vast improvement over last years. Not entered yet, but seriously considering it now that the new route map is available. So happy that they listened to customer feedback and have made what look like very positive changes. The long drag out to Doune is flat and unless it's into a strong wind could set runners up for a very quick time. Only the not too bad climb after Doune and the shorter climb in the Stirling Uni grounds look like the most trying part. Ran last year, and I agree it's good that they have listened to the feedback. I was lucky and got an early bus, but I know there were some people who got there pretty late because of the shuttle buses, so a city centre start is much better. And those loops were a killer, mentally and physically. Sadly, with the date change, I can't do it this year. I'm signed up too, failed to even get to the start line last year due to injury. It was going to be my first Marathon - I was gutted. So I have unfinished business with Stirling lol. I’ve signed up for this one too. Will be my first marathon! Almost only 10 weeks to go now, I hope everyone's training is going well and the horrible weather hasn't thrown too many spanners in folks training plans! Does anyone have any idea of where the water stations are? I can't see it on the website. You need to zoom in on the "Marathon Course Map" embedded half way down this page http://www.greatrun.org/stirling-scottish-marathon rather than the clickable link further down. They appear to be at 4,7,11,13,16,17,20,and 23.5 miles approximately. I don't see any mention of sports drinks/fuel although SIS is one of the sponsors. Last year they changed from the advertised Lucozade to another brand (can't remember the name) of sugar free isotonic drink. Not sure how that would have gone for anyone relying on it, but as I can't stomach Lucozade, I had my own gels with me. That isotonic drink last year was disgusting. I took a bottle, had one sip and threw it away. Probably contributed to my pace disintegrating at 23 miles. Yep, getting to the serious end of training now and the taper should be commencing very soon for those running it. I had decided just to do the 1/2 this year but kind of regret not going for the full course. Good luck everyone running the marathon! It looks a great route this year. I'm in! Race number 1470 (Blue). I'm currently somewhere between desperate for it to start, and terrified that it will! Hi I am doing my first Stirling marathon. Does anyone know how easy it is to get to the start from where I am staying which is Dunblane?? The start is Falleninch Field, below the castle. They are talking about parking being available at the old school in Raploch, but I do wonder how many cars that can take. Trains aren't running on Sunday, which is a bit of a pain. It's not going to be terribly easy - could you get someone to drive you? Take a taxi? Well done to everyone who competed at Stirling yesterday. Lovely day for it - slight in the face breeze most of the way. I got a new PB in the half (1:27:43) so over the moon considering I didn't expect anything from it - still a bit of recovery from my Ultra a couple of weeks ago. I was back in time to stand and applaud the full marathon winner over the line in a fantastic 02:29:19 - Michael Smith from Central AC. I thought the finish line was in a much better place this year, though understand the wee hill up to the like was probably the last thing some runners wanted. If I don't get in London next year, Stirling will be on the list. I didn't do last year's, but the route this year was great. I did the full, and loved the route, the weather and the support. A shower of cold, nasty, penetrative rain around mile 20 had a visible effect on the runners around me - the energy level just dropped - and from there on it was a bit of a struggle to get to the end. Well done Alan! There were cobbles in the town centre shopping district just before the climb to the finish. The local support is fantastic isn't it. I'll never forget the support in Doune, Dublane and Bridge of Allan last year. Great to hear that you enjoyed it! I did the Stirling marathon on Sunday and I have to say it is a vast improvement on the inaugural event the previous year. The terrible underpass/loop system is gone and the finish area is much more welcoming than the cramped field with little/no facilities of 2017. Two gripes though: 1) the start area was a bit cramped - no room to get a bit of a last minute limber up, and no real excuse for it as there was plenty of space to expand the field out, 2) merging the faster marathon runners with the slower half marathon runners around the 17-18 mile point was stupid. It didn't cause me too many issues but I know some of the marathon runners had to shout at people to get the f*ck out of the way. If they sort out those two issues, it would be near perfect for me, up there with Loch Ness as my favourite event. Shazza - I ran Stirling last year, for my first marathon so i can tell you about how it went for me for what its worth. Mile 0-4 are uneventful and pretty level. Mile 4-11 the course then starts to rise until you reach Dunblane Nothing awful, but some the inclines substantial enough - this section sapped me last year so prepare for it. The high point of the course is the climb to the overpass before Dunblane. Theres a decent gradient here, I attacked this last year and boosted up it - cost me later. Theres a bit meandering to be done through Dunblane, left here, up there, turn around this and then finally you're leaving good news theres a lot of support along the way. Enjoy it. Mile 11-15 as i remember these were mostly flat but there was the odd incline. Bridge of Allan turned out for us last year, i'm sure they will again. Mile 15-18.5 apart from an annoying excursion into Stirling Uni campus this is flat. The annoying excursion includes a tough hill to climb and then a loop round the campus before running back down the hill you ran up, to find yourself pretty much where you started. Mile 25-26.2 is designed by a sadist, you'll turn left and run into an overpass above the railway line. Then, a right turn to another climb - not awful but after 25 miles who needs it? Then a tight hairpin turn. Thankfully theres a downhill into city centre. But for the last half mile you'll be climbing and it's a decent climb. With 0.2 miles to go it levels off and you can coast in and taste the victory of completing. 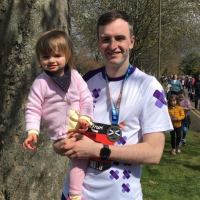 I missed my goal time last year so my memories of the event are a bit tinged with irritation - but it was well organised and supported, it was easy for friends and family to be there as it started and finished in Stirling. A good event, that i had planned to do again this year, best of luck Shazza, let us know how you do!